Biscayne National Park protects the larger portion of south Florida's Biscayne Bay, a uniquely tropical lagoon harboring crocodiles, manatees, dolphins, and Caribbean fish. Tropical trees cover its islands, while the world's fourth-longest coral reef sits offshore. Native Americans lived here thousands of years ago; the Spanish held it for 200 years. Hundreds of ships foundered on the reef, fueling a lucrative wrecking industry. In the late 1800s, hardy homesteaders created an agricultural and fishing community. In the 1920s and 1930s, it became a playground for the newly rich and famous. Bracketed by Miami and Key Biscayne to the north and Key Largo to the south, the nearby population eventually grew to over 2.5 million residents and over 14 million annual visitors. To protect these unique natural and historical resources and to assure its enjoyment by future generations, a half century ago, the federal government created Biscayne National Monument, which later became Biscayne National Park. Kirsten Hines is a writer and photographer whose images are featured in this book. James A. Kushlan is a biologist, writer, and conservationist who grew up on one of Biscayne Bay's tributary streams. 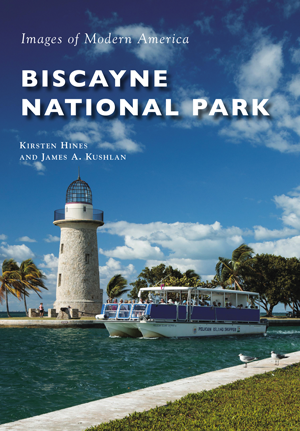 Together, they have coauthored several books, including Images of America: Key Biscayne.